Be it a handheld homogenizer, benchtop homogenizer, high-shear homogenizer or automated homogenizing system, we have a homogenizer to suit your needs and can assist you in easily choosing a lab homogenizer. 1. How does this homogenizer differ from the competition? What makes it superior in quality and cost-effective for the scientist? The biggest thing that sets PRO apart from our competition is our PRO Quick Connect Generator Probes. 2. What accessories are necessary to run the unit? To begin homogenizing all you need is a motor unit and to select your generator probe accessory. With our homogenizers, there are no special tubes or beads to have to invest in or to continue to buy. 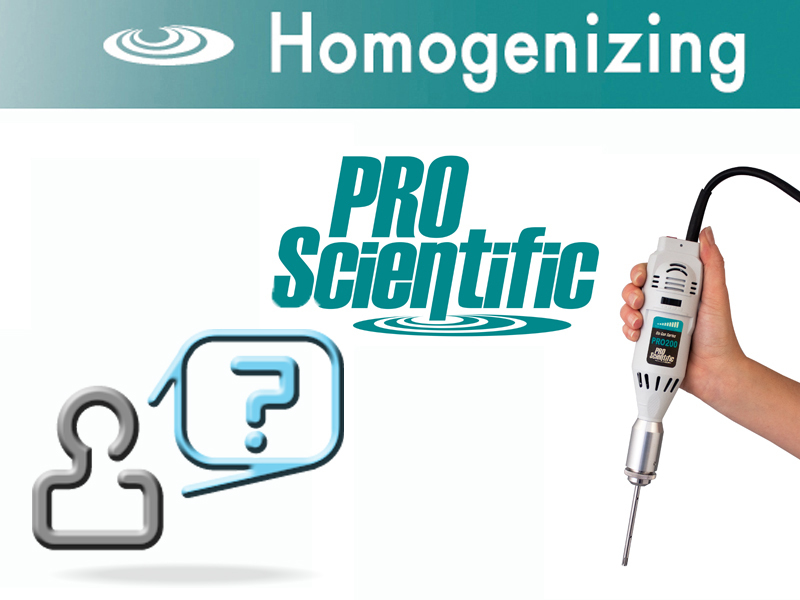 While we feature a full line of homogenizers and generator probes that may be purchased separately, PRO Scientific is the only manufacturer that takes the guesswork out of picking a homogenizing package. We have twelve economical homogenizing packages that have been pre-selected to assist in this process and provide you with everything you need to begin homogenizing. So you can choose your own setup or pick one of our economical homogenizing packages. 3. Does the company offer demo units for the scientist to test out? 4. Does the company offer application and technical phone support before/after the product purchase? Absolutely. We pride ourselves on making sure the equipment you purchase works for your particular application. We have an extensive application database to assist you with any questions you might have. Also, our sales associates are happy to provide some homogenizing tips to make your processing a little easier. We also have an in-house service center to troubleshoot any problems that might arise with your PRO homogenizing equipment. With proper maintenance, your homogenizing equipment can last ten plus years! Our mechanical generator probes contain PTFE bearings and/or washers that prevent metal on metal rubbing of these rotor-stator generators and this PTFE material will wear with use. Complete replacement parts for our generator probes are available. 5. Ask about replacement in case the product parts break down with use. On the rare occasion that a problem arises, our sales and service staff can work with you to make sure your downtime is limited, either by sending replacement equipment or expediting repairs. We know each situation is unique and will work with you the best we can. 6. Finally, ask about the cost of the purchase, installation charges, and warranty extension costs. PRO Scientific is the only manufacturer with as comprehensive of a homogenizer line. From economical micro-homogenizing packages to larger automated pieces of homogenizing equipment, we have a homogenizer for every budget. Our basic equipment requires no installation while our automated system includes installation by a PRO Scientific representative. While we do not offer an extended warranty, all PRO Homogenizers feature an extensive 2-year warranty on motor units AND generator probes. To help take the guesswork out of choosing a lab homogenizer, we have created a variety of PRO Homogenizing Package Kits.